Looks terrible (see below): the fully preserved ceiling of the 1,700-year-old Temple of Jupiter in Split, Croatia. It’s been three years since I I last posted on the Perils of Online Site Reviews, and more than four since I did so for the first time. In those days, Peter Sommer Travels offered tours and cruises in three countries, now it does so in six. In other words, it’s been a busy time, but I still sometimes find a moment to divert or amuse myself by browsing that famous and very dominant website to look for the worst reviews of the sites and attractions we visit, and especially of the ones I myself, my colleagues or our guests find the most interesting or the most beautiful. It is a given that different people have different interests and even more different perceptions, and that’s not the topic here: the interest resides in unfortunate misunderstandings, bizarrely misguided expectations, oddly skewed perspectives and so on. Mis-guided may be a key term here. This blog exists to present the work of Peter Sommer Travels, a company specialised in expertly guided tours and cruises, and we do firmly believe that good-quality guiding is one of the royal roads to a fuller understanding and thus the fuller enjoyment of a region’s culture and heritage. Other avenues include spending a little effort on preparing one’s travels beforehand, or carefully using the various sources of information that are available more or less universally today (printed, online or on display at sites and museums) during the trip. 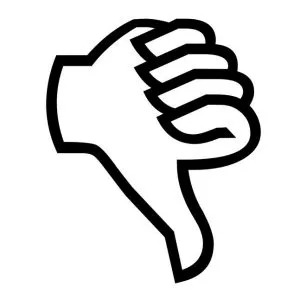 It is worth noting that the quality of the bad reviews on that aforementioned (albeit not by name) website has actually improved: I assume the more inappropriate ones are more likely to be rejected now. So, while I used to (and still do) see some humour in the sheer absurdity of some site reviews (and while I also doubt their general purpose, as opposed to reviews of restaurants and hotels), amidst any head-shaking or face-palming there is always the thought of what a pity it is that someone did not find a way to enjoy or appreciate or understand the things I love and our guests love. I am not arrogant enough to think that I could have salvaged the experience in each and every case (in fact, in some cases clearly nobody could have), but now and then I would have liked to try. Enough introduction. We proudly present a new set of bad online reviews for six more among our favourite sites, one in each country we visit. …virtually nothing – the Peristyle at Split. Well, as I said, Diocletian’s Palace is one of a kind, by far the best-preserved such edifice in the world. Most of the monumental parts of the palace complex are still there to behold, and virtually nothing has been reconstructed. It’s hard to miss the monument: the enormous external walls, nearly fully preserved, form a rectangle measuring 160 by 190m (525 by 623 ft) and 16 to 23m (52 to 75 ft) tall. I congratulate the reviewer for missing that, he or she was evidently distracted by something more eye-catching than one of the hugest Roman buildings to survive. No part, I can assert, is usually smouldering. Yes, all kinds of buildings have been added in the course of seventeen centuries, but that’s what history does. Also yes, there are many hotels and tourist apartments within the Palace complex, but that’s because it is part of a living city, which is why it is still there in the first place. If it weren’t for its centuries of reuse and its continuity as an urban centre, we wouldn’t have it to admire. This one is a sad case: an informed visitor came with great expectations, but ended up not being able to focus on the extraordinary monument that is there to be seen. Good timing, patience, a keen eye and a good guide would probably have solved his problem. Delos! The tiny and uninhabited island near Mykonos is one of the most important and most impressive archaeological sites in Greece, and in the world, recognised as World Heritage. It’s an exceptional place with a unique history. Mythically, Delos is the birthplace of the gods Apollo and Artemis, which made it one of the most sacred places in the Aegean, and apparently the first Greek sanctuary to be embellished with monumental marble buildings around 600 BC. The archaeology of Archaic and Classical Delos, favoured by Athens as a place of ostentatious piety, is second to none. Delos had a second flourish as a Roman-dominated tax haven in the 2nd and 1st centuries BC, equipping it with unusually rich homes and public spaces or markets, all preserved substantially to be seen today. It is a guide’s paradise, because there is so much to show and to tell. Delos also has an on-site museum, illustrating the splendour of the Archaic sanctuary, a hub of Early Greek sculpture, and the luxury of the Hellenistic mercantile settlement with all its wealth expressed in furnishings, wall paintings and other fancy materials. A load of rubble: the House of Dionysos on Delos. Not suprisingly, Delos is not a party island like nearby Mykonos. The whole island is an archaeological zone, with studies and excavations ongoing, and all of it is off limits for commercial development. You go to Delos for the archaeology. Anyone who pays money to go there ought to know that. Or so you might think. This, signed with three actual names I omit here (they’re from a country that prides itself in its fine education system), is a supreme example of irredeemable idiocy and ignorance on the part of the people travelling, who wanted beer, not culture, and therefore should never have set their feet on Delos and the most minimal effort could have saved them the trauma. It is clear that the people in question had no idea where they were going or why, but it is also clear that once there, they were totally and hermetically closed to a cultural experience and devoid of any curiosity to find out about the wonderful things they might have seen. It is very difficult to imagine such a mindset in its emptiness: imagine setting foot on a small island covered densely in archaeological remains and having no interest other than a bar. Sad! One might also blame the agent who sold this particular excursion as irresponsible, but that depends on what they knew when asked to arrange a trip to Delos. Perhaps the agent was just a little irresponsible and quite clever: “there’s one born every minute”, or perhaps they were approached to book a trip to Delos and just did their job. Various types of rock? The Golden Collar of Borrisnoe (Co. Tipperary) is about 2,800 years old and just one of many such mysterious items in the museum. Ireland is a country with an enormously rich archaeological heritage. Much of that heritage consists of sites scattered around the country and accessible only by visiting them where they are. The other part, as in any country, is artefacts, ancient objects of various types. Dublin has a fine and very old National Museum, its archaeological display originally conceived in mid-19th century by Sir William Wilde, father of the writer, Oscar. There are many things to say about that museum and its exhibits, housed in a very fine historic building, and perhaps also some things to criticise. To start with, however, there can be no doubt that it contains a vast amount of astonishing material, including many objects that speak for themselves, through their materials and workmanship. Its exhibits are endlessly rewarding to the careful observer, with many displays that invite us to linger and to admire the intricate details of the treasures on display. Not being a collection of Classical sculpture, it also confronts most visitors with a range of material they may not be too familiar with. Sounds interesting? Dull! The Ardagh Chalice, from the 700s AD is a masterpiece of Celtic art. Made from over 350 separate pieces of silver, gold, bronze, pewter and enamel, using every technique of metalworking available at its time, with detail barely visible to the naked eye. Only two such objects exist today, both on display in Dublin. That’s it? The collection of Bronze and Iron Age gold objects, one of the world’s largest, consisting mostly of personal ornaments, is second to none. As important are the collections of material from the “Celtic” Iron Age, especially the gruesome bog bodies, giving us direct insight into the treatment of individuals in an era of contested and ritualised royalty – strange stuff. There is also the “Treasury”, highlighting the most extraordinary metalwork of the island’s Early Christian era, connecting Celtic and Scandinavian strands and producing objects of astonishing intricacy and beauty, unparalleled in Europe at the time: no other museum on the planet has a similar connection. Excavations in Dublin since the 1970s have also revealed one of the best-preserved “Viking” urban sites in Europe (alongside York), and there is another fantastic exhibit on that, again second to none. Yes, there is a very small Egyptian exhibit, too, but who’d travel to Dublin for that? The information panel at the sanctuary of Athens in Priene, one of many on the site. Note the city plan on the top left. Impressive, but wrongly reconstructed (the columns should be taller): the Temple of Athena at Priene. This area of Turkey is awash weight Roman ruins, with Ephesus just up the road. This sight in terms of location and size is impressive, however this place hasn’t been excavated and rebuilt like the other sights. This is more a large jumble of rocks and pillars etc. Having a car we decided to visit here. It’s very cheap to get in – but that’s because it’s a big hike uphill to get there and the ruins are basically just scattered all around. There is one section of pillars still standing, but it’s very difficult to get an idea of the layout of the place and what the scattered stones might have once been. If you have spare time and a car go visit, if not give it a miss. Granted, the site is virtually entirely Greek, not Roman, and granted, it has actually been excavated much more extensively than all its neighbours and some key features have been reconstructed in part. That’s not my concern. What bothers me is where it says “it’s very difficult to get an idea of the layout of the place” – that’s exactly the opposite of the truth. Out of all Greek cities that can be visited, it is nearly the only one where the entire urban scheme, the whole city plan, is plainly there to observe and understand, from the city walls and gates, via the regular grid of of streets and lanes, via the public buildings serving the city’s politics, administration, commerce, worship and entertainment, to the acropolis or citadel high above. 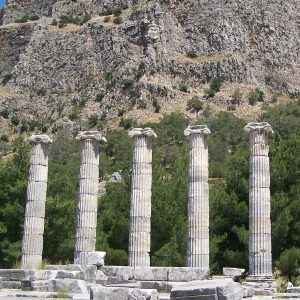 Most importantly, Priene offers access to the remains of the private homes of its citizens, an aspect that is exceedingly rarely approachable in Ancient Greek cities. It’s all there, like walking through a town plan, and not only is there a decent amount of large information panels of reasonable quality – the very first one of them, at the site entrance, is all about the city layout, and the city plan is repeated on most of those within the site. It couldn’t be clearer if you tried. This is especially disturbing because the review, while short, is a well-written one. It’s great when people desire to understand a place, but if they’re unwilling to prepare themselves and to use the information available on site, what else could possibly be done? My suggestion, of course, is to come back with a good guide! I have written about this extraordinary place on this very blog, praising the great beauty of the place. 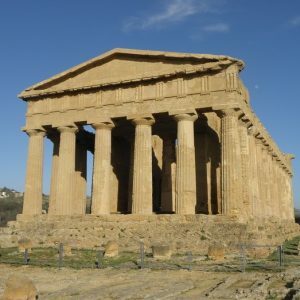 Agrigento, ancient Akragas, was one of the most important Greek cities on Sicily and its remains are of great interest and even greater beauty. The “Valley” part is a misnomer: it is actually a ridge, where the ancient city decided to place its main shrines, in a stunning setting overlooked by the city itself and overlooking the southern shores of the island. It features the remains of no less than seven temples, one of which, that known as the “Temple of Concordia”, is the joint best-preserved Greek temple to survive (the other one being that of Hephaistos in Athens). Viewing it is like what it would be like to see one of only two fully-preserved Vermeers or to listen to one of only two surviving pieces by Mozart (or by the Beatles, we’re a British company after all). The nearby Temple of Juno/Hera is also remarkably well-preserved, including its altar. The other five are, admittedly, in various states of ruin, but we’re talking very extensive and informative ruins here. Especially the huge Temple of Olympian Zeus, a most unusual building, is still highly impressive even in its destroyed state, due to the huge telamons, sculpted human figures that served as pillars, their enormous fragments still scattered about. The place is certainly fascinating, but also simply beautiful. Well, that’s what I say. Hmm, that’s another way of seeing it. One is left to wonder what the reviewers were expecting of a site that is famous for its ancient temples, as indicated by its name. Nobody can win an argument about taste, or even about beauty, but it is jarring to see these visitors unimpressed by the Temples of Agrigento, even just in terms of engineering. Usually, I’d argue that a good and expert guide (that’s what we’re offering at Peter Sommer Travels, after all) might have been the way to make this place work for the reviewers, but sometimes that argument does not work. If you’re not prepared to take an interest in an archaeological site, and if you’re unable or unwilling to appreciate a unique ancient monument, just don’t go. Leave it to those who can enjoy the experience. Underwhelming? Our guests being underwhelmed at Milecastle 39 (known as Castle Nick). Hadrian’s Wall is one of the most famous archaeological monuments in the United Kingdom, and arguably the largest. Built in the 120s AD to control and protect the northern border of the Roman province of Britannia, it was an extraordinary undertaking: a linear border wall built of stone on a length of 118 km (73 miles), supported by over a dozen large forts, 80 smaller ‘milecastles’ and about 160 watchtowers. Additionally, there was a moat-like ditch along the wall’s northern side, as well as a system of earthen banks and ditches running parallel to it in the south, probably to delineate an exclusive military zone. In three places the wall crossed rivers in the form of wall-bridges. Beyond the wall proper, the defence was continued along the coast of Cumbria for another 42 km (40 miles), with 25 more ‘milefortlets’ and circa 50 towers. There are other Roman linear border defences of the same era, but none are as impressive or as substantially preserved as Hadrian’s Wall. Obviously, an impressive sight – but wait! “Obviously not a lot of thought went into the original construction”: part of the Wall at Hotbanks Crags in its central section. “A bit Crap”: the most famous section of Hadrian’s Wall, at Cuddy’s Crags near Housesteads Fort. Oh dear, he sounds annoyed. Let’s give this a little context. The Great Wall of China is about 200 times as long as Hadrian’s Wall and well-preserved in some sections, but most of its current form is quite recent, dating from the 14th to 16th centuries AD. Its ancient predecessors were mostly made of earth. The Berlin Wall, built of concrete elements, was comparable to Hadrian’s Wall only in terms of length (at 160km or 99 miles, same as Hadrian’s Wall plus Cumbrian shore defences). It existed from 1961 to 1989 and very little is now left. The 530-metre (0.33 of a mile) Byker Wall (perhaps a little less familiar) is a 1960s/1970s housing development in Newcastle! The reviewer is right in so far as that Hadrian’s Wall has suffered a little in the last fifteen centuries or so, like any ancient monument, and is not currently being maintained, a terrible oversight on the part of the Roman Empire! It’s disappointing to see such an extraordinarily uninformed review: few ancient monuments offer more access and information than Hadrian’s Wall. Much of its central section is set in magnificent landscape, and there are dozens of sites with information panels, museums and exhibits, reconstructions and so on. They all combine to offer a range of fascinating insights of life on the Wall during its two centuries of use, of the troops (probably about 12,000 at any given time) that guarded it and that came from all over the Roman world, and of the civilian life in the numerous settlements associated with the Roman military presence. The real question here is why someone who actually makes the effort (and has the skill) to write an online review would not make the lighter effort of using the same internet to gather some information. A late 2nd-century mosaic depicting a leopard, in the museum on Delos. All of the above is certainly funny, but not quite. The fact that in this modern day, when so much information is so easily available, supposedly literate people can still entirely miss the point of such exceptional monuments, such wonderful examples of human achievement, such spirit-lifting sights that we are all meant to share and to be proud of for our collective human experience, and the creativity it has given rise to, is saddening. This is not to make an arrogant point about ignorance versus sophistication, but a pertinent one about how people are not educated or prepared to appreciate our human history and our creations, how they are rendered unable to enjoy the best our species has achieved. Again, if you feel this is judgemental: is human achievement measured in beach bars offering mere momentary pleasure or in inspiring art providing lasting joy, and provoking endless thought? As I wrote twice before, the antidote to such disappointment is either preparation (guidebooks, websites, anything) or going there with someone who is excited about what you are seeing and who knows how to explain it and how to help you discover it for yourself. That’s what Peter Sommer Travels is specialised in. You can see the Palace of Diocletian at Split on our cruise From Split to Dubrovnik or vice versa; Delos is one of many fine sights on our Cruising to the Cyclades; the National Museum in Dublin has pride of place on Exploring Ireland; Priene is a memorable part of Cruising to Ephesus and From Halicarnassus to Ephesus, as well as In the Footsteps of Alexander the Great; Agrigento is given due attention on Exploring Sicily; and Hadrian’s Wall is the main focus of an entire tour that also covers its surrounding region: Exploring Hadrian’s Wall – Romans, Reivers and Romantics. Our mission is to bring all the interest, all the beauty and all the fascination of these places, and so many others, to you, to share the experience with you and to bring meaning to all of them.